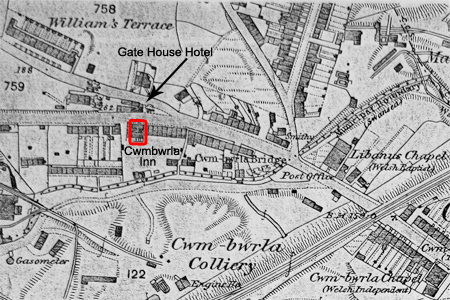 Cwmbwrla Inn opposite it's twin, the Gate House Hotel. Trainer BMW Dealer, on the right and Boots Opticians to the left, 2012. The area is roughly outlined, opposite "The Gate House" on Carmarthen Road. without reference to the Gate House Hotel and also Cwmbwrla Inn. 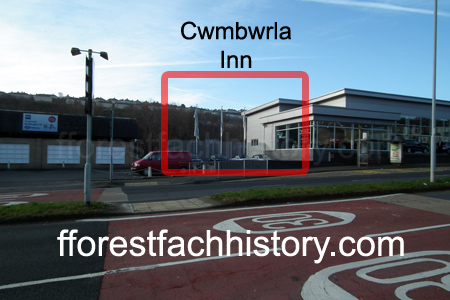 From the demolision of the Cwmbwrla Inn, came an alternative freehold site for the building of new licenced premises; which became the Rhymbuck. Currently the premises is called " Three Sisters public house". There was a court case involving Mary Griffiths of the Cwmbwrla Inn brought by the Inland Revenue she had been selling spirits while only holding a beer licence. Her excuse was she gave a drink to her regular grocery customers, but she was found guilty and fined £12 she was going to be fined £50 but the magistrates thought this would bankrupt her. (C) H34 BUILDINGS, COMMERCIAL etc. Swansea Police: Mr Mullany and Thomas Rees, of the Inland Revenue -V- Mary Griffiths,Cwmbwrla Inn. (C) Q53 CRIME AND PUNISHMENT etc. Benjamin Thomas,Cwmbwrla Inn,Cwmbwrla.,licensed victualler,tin sorter.Creditors meeting. (C) Q52 CRIME AND PUNISHMENT etc. (C) Q39 CRIME AND PUNISHMENT etc. (C) D41 TRANSPORT, ROAD etc. (C) Q21 CRIME AND PUNISHMENT etc. (C) F55 DISASTERS AND ACCIDENTS, etc. (C) H22 BUILDINGS, RESIDENTIAL, etc. Cwmbwrla. Commercial. Richard Morgan, Cwmbwrla inn. George Smith was the landlord. William John Cawden was the licence holder. John Robert Solman was the landlord. Thomas Henry Jackson was the landlord. Richard Thomas was the owner. Croswell Breweries took over the ownership. Maurice Murphy was the landlord. David Reynolds, Cwmbwrla hotel, 24 Carmarthen Road (seems a contradiction of number and placement)? David Reynolds was the landlord. A music licence was issued. David Ellis Simons was given the licence. Alfred Pomford was the licence holder. David Hitchings was the licence holder. Laura Pomford was the licence holder and still was in 1962. Terms were agreed between Rhymney Brewery Co. and Swansea Corporation, whereby the public house was demolished for road widening. The Corporation provided the brewers with an alternative freehold site for the erection of new licenced premises. Rhymney Brewery and Buckleys Brewery formed a consortium for the new premises named the Rhymbuck. Later this name would change to the Three Sisters reportedly after the three smoke stacks of the Cwmfelin Works.